About Giovanna P. Message Giovanna P.
I cant thank Giovanna for the terrific time I had in Matera. She is just perfect! A real sister and a friend. I loved her! She made me discover the true history of Matera. I dont usually take tour guides in my trips to Italy but I am thankful to find Giovanna by chance. She is one of a kind and someone you will never forget. I travel to Italy all the time and this is the best trip ever (I really mean it) was very enjoyable and energetic; we had good talks and so much fun together. Giovanna is a 10 stars! Giovanna is a real gem! This is not my first trip to Italy but its my first to try a tour guide. I loved the experience and I would re do it again with Giovanna. She is outstanding and down to earth! I cant thank her enough for the great time we had together in Alberobello. She made me realize the rich history of the little town, which I never knew about. I learned so much about Italy and Italians in just one day. Giovanna is just perfect cant describe her in 500 characters. I miss her company already! It was a fantastic tour! You could see that Giovanna was a specialist in the tour she gave and we've learned a lot. She was kind and explained everything in a really great way, her English was perfect and I really would recommend her as a guide. Nothing short of outstanding. Giovanna is delightful and full of knowledge and passion for her community. We had a STELLAR day. Recommend her 100 percent! Thank you Giovanna! PS: The mozzarella and olive oil tours were the best according to our group of four! An amazing day with Giovanna, she is so passionate about her part of Italy. Matera and Alberobello we equally fantastic to see and here about, possibly the best day of a holiday i have had. Highly recommend going on a tour with Giovanna and allow enough time to see this part of Italy. TOUR GUIDE RESPONSE: Dear Lucas, Mary and Mark many thanks for these words:) I remember our day together with a huge smile! You are a lovely family and you will always welcomed in Apulia:) ciao ciao! Giovanna is a perfect tour guide, very personable and competent. Although we had little time, she has managed to bring us closer to her homeland Apuglien. You can feel that she loves her home. From Alberobello she showed us not only the tourist side, but also the original of the place. We can warmly recommend her as a guide to anyone who wants to know more about Apuglia than you can read in guidebooks. TOUR GUIDE RESPONSE: Dear Elmo thank you so much for your kinds words! I was glad to introduce you a part of my region, hoping I will give you the wish to come back to discover more our land;) ciao ciao!! Giovanna is the best tour guide ever! Giovanna clearly loves what she does and it shows in the little things and details that she thought of. We truly felt taken cared of and it gave special meaning to the term "tours by locals". It felt like we were visiting family and were being shown around by a good friend. We highly recommend Giovanna as a tour guide in Apulia! Giovanna, we still can taste the fresh from the oven pasticciotto you treated us to in Lecce! Giovanna's tour is not your ordinary tour, she had surprises for us and brought us to secret local spots. It was a treat to visit a farm to table mozarella maker in the countryside on our way to Matera. She also surprised us with a birds eye view of the entire Matera. Book with Giovanna-you will not regret it. You'll get a truly local experience. Giovanna is fun, friendly, knowledgeable, speaks excellent English (French and Italian too)! Giovanna is the perfect guide. She was all smile, very fun to be with, she asked us the type of visit we were looking for, she knows the 'less-touristic' and 'local' places and people. You can feel that doing this kind of work is her passion and it is showed at all time during the day. She was able to adapt easily to our wishes. She is also very very knowledgeable about her region, the history, the people, the habits ... It was a perfect day in Bari, Alterobello and Locorotondo. Merci Giovanna ! My family and I had the pleasure of spending a day with Giovanna exploring Puglia. She did a wonderful job of introducing us to the culture of Puglia and allowing us to experience things we never would have been able to do on our own from learning to make homemade pasta to discovering how olive oil is made to being invited into a residents home in one of the trullis in Alberobello. She truly made our day special and I would highly recommend her to anyone looking to experience Puglia. TOUR GUIDE RESPONSE: Dear Bruce and family thank you so much not only for this lovely rating but also to be engaging travellers so interested to our land and culture! The "orecchiette" you have made is an excellent proof of your melting with our food tradition;) And of course I wait for you next time to continue together the discovery of Apulia and Basilicata, where there are several spots you will enjoy;) Grazie mille!! From the moment we met Giovanna we knew we were in for a fantastic day. Giovanna was a delight to spend the day with showing us things that you just don't get to see on a group tour. Giovanna you certainly left us wanting to see more of your Italy and we will definitely be back. Our only regret was that we run our of time and didn't get to spend more time with you. Well done. TOUR GUIDE RESPONSE: Dear Annette, thank you so much!! I'm so happy that just 5 hours in Apulia were enough to convince you to come back in the south Italy to discover our magic land! I will do my best to offer always news and authentic experiences off the beaten tracks! Wait for you:D Grazie mille! My wife and I enjoyed our half day tour with Giovanna immensely. She is a bubbly personality and provides fun and accessible insights into the many pleasures of Puglia, a place clearly close to her heart. We enjoyed Giovanna's approach to the tour and her invitation to indicate our interests which provided her with an opportunity to tailor the tour. We would recommend Giovanna to anyone and must also mention that as English speakers with rudimentary Italian her command of English is excellent. TOUR GUIDE RESPONSE: Dear Jhon and Nicky many thanks for this words! I m so happy that you have enjoyed your vacations in Apulia and you have shared with me your pictures and moments of your stay in this land where you will always welcomed! Grazie grazie grazie:) A prestissimo! Giovanna has such passion for southern Italy and provided much more than the history of the area and buildings. She provided insights to the people and the true heart of the culture. Having grandparents from Calabria, my wife appreciated Giovanna's compassionate and lively discussions regarding life in the south of Italy. Our tour of Matera was an experience we will never forget. Thank you Giovanna! As a frequent traveler to Italy I am experienced and discerning when it comes to guides. I thoroughly enjoyed the depth of knowledge that Giovanna brought to the eyeopening tour of the Trulli and the vicinity of Alberobello. 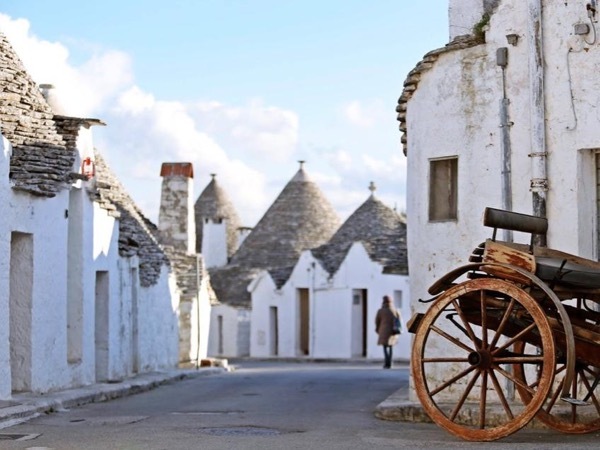 She brought enthusiasm and careful study to the task of displaying the history and daily life of Alberobello. The Trulli habitations were very interesting to a professional builder (her client). Her approach included engaging with residents of the town. High praise;brava Giovanna!